Down a hedge lined drive off a quiet country lane, Pantiles is positioned to fully embrace its stunning outlook towards White Sheet Hill and the Blackmoor Vale. 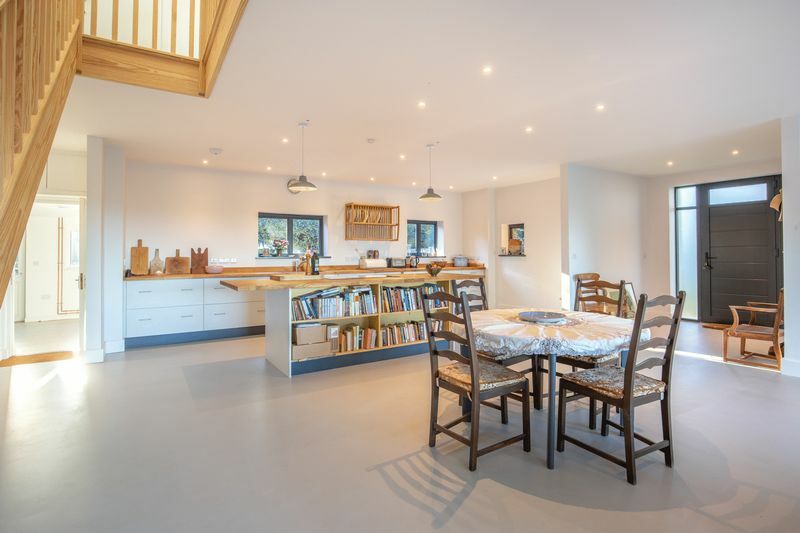 Stepping inside this modern, larch clad building you enter into a bright open living space, the heart of home. 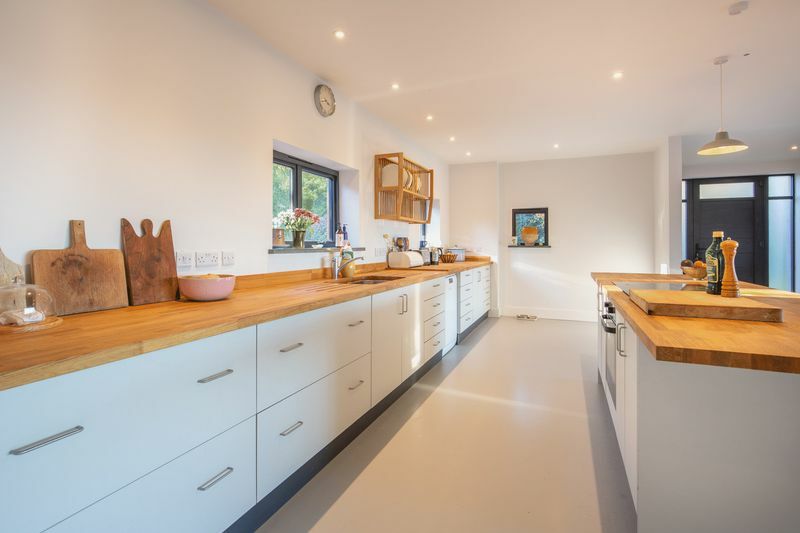 The resin flooring, neutral décor and oak topped kitchen all blend seamlessly to create a warm, yet minimalist home with a symmetry and attention to detail that is very special. 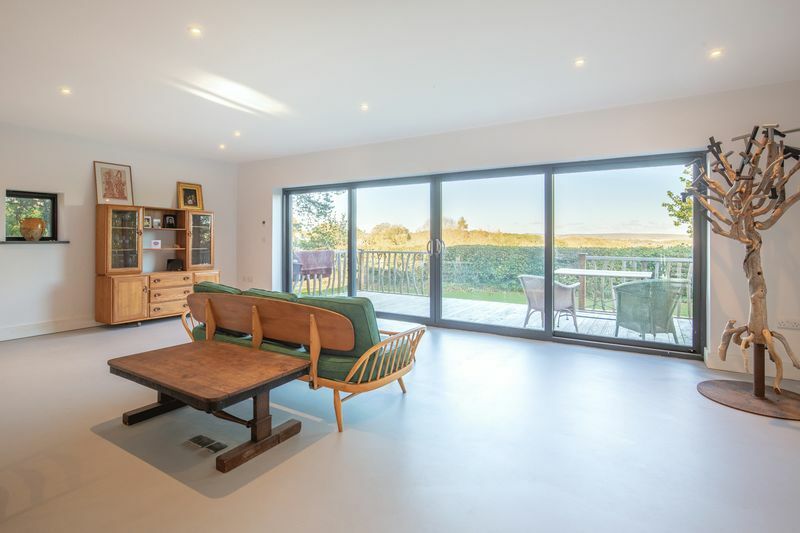 The owner has extensively renovated the property to create something that is functional and beautiful fully embracing its unique location. 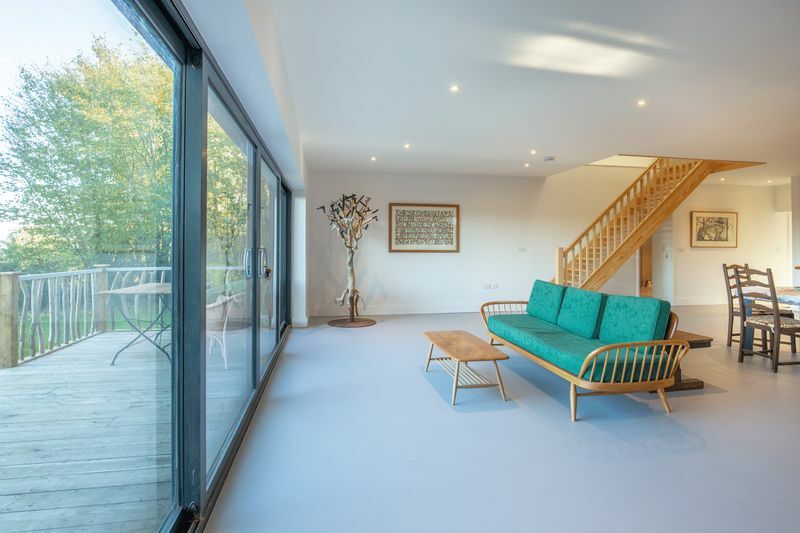 There are some lovely details, such as the Blue Lias window sills, and the outside veranda approached through the large sliding doors is edged with a railing made with exotic hardwood. This private spot is the perfect extension of the house overlooking its beautiful surroundings. The horizon is a changing stage set of light and Somerset beauty seen from many windows in the house and is constantly entrancing. The ground floor has under-floor heating throughout and all plumbing, electrics and wiring are newly installed. 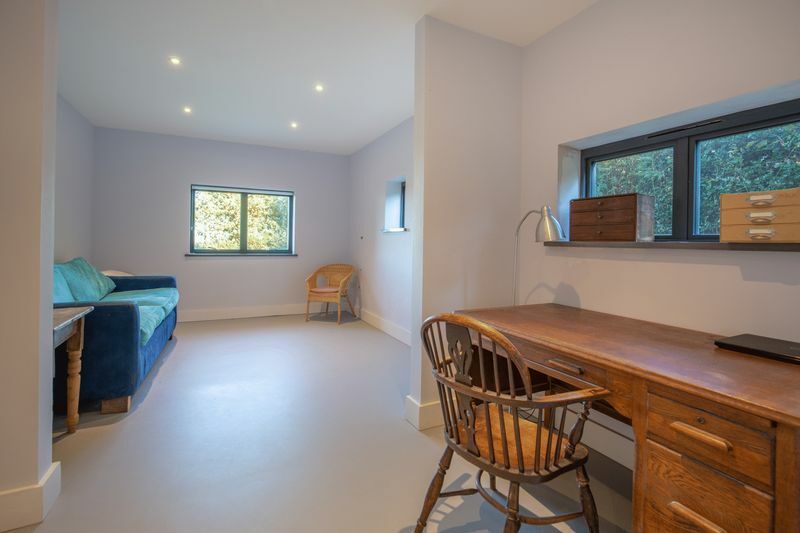 Off the side of the kitchen is a well sized snug or home office with a walk in shower room, that can also be used as a fourth bedroom. 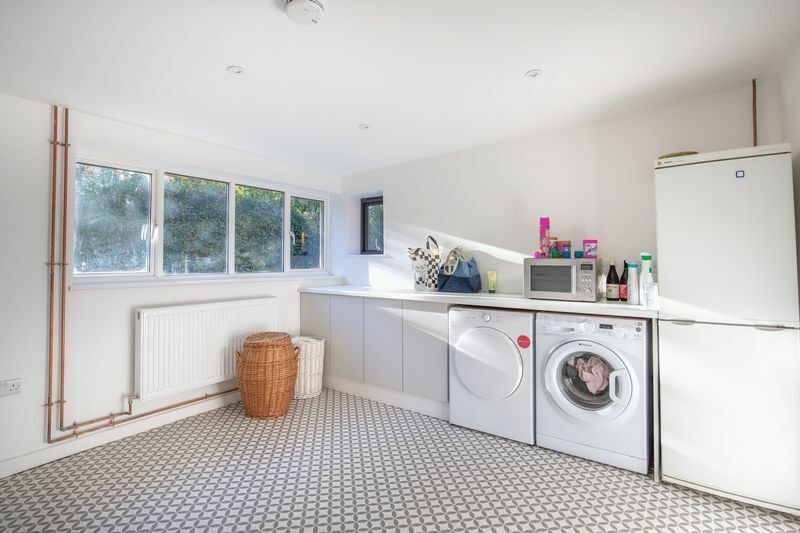 To the back is a large utility and laundry room, with separate access and a storage room for the boiler and a mains pump pressure system. The room is lined with cabinets providing a huge amount of storage. 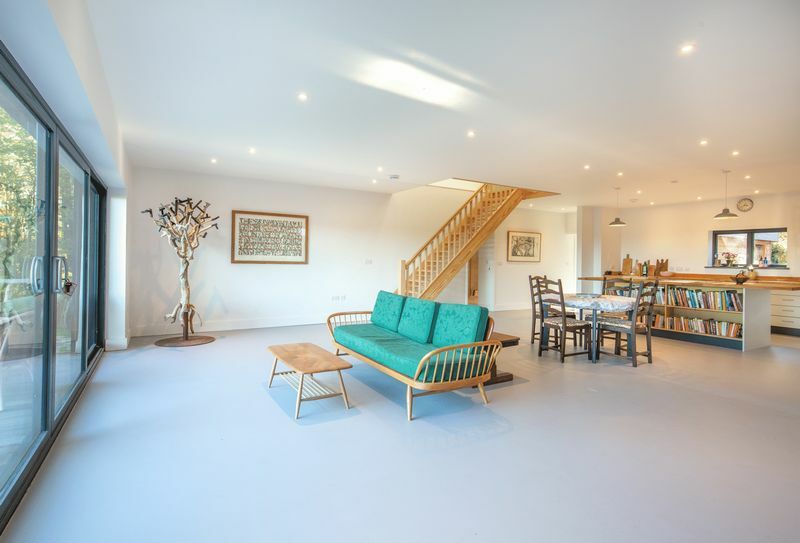 Up the magnificent wooden staircase to the first floor there is a large airy landing leading to three bedrooms with a continued focus on light and the view. Built in storage cupboards and drawers are dotted about most of the rooms. 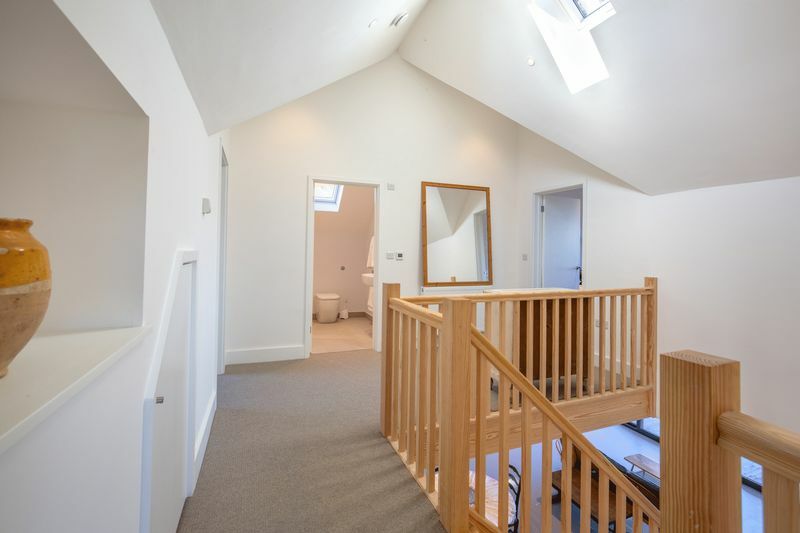 There is a family bathroom with a double ended bath and electric underfloor heating. The entire first floor has been sound-proofed under foot. 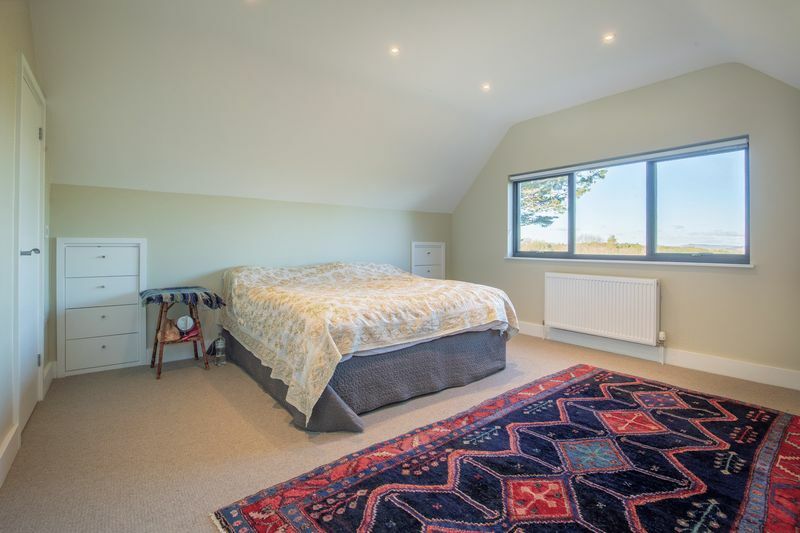 The master bedroom has a beautiful triple picture window aspect with the same view as the living space, with an ensuite shower room and plenty of built in storage. The Larch cladding on the outside of the building is a warm bright amber, which will fade and mellow into a soft silver with time. There is a level lawned garden that entirely flanks the house and boarders planted with mature trees, perennials and flower beds. A wooden double garage stands at the entrance of the drive to the property and there is a useful storage shed within the garden. A shingle gravel open parking drive at the front of the house provides parking for 4-5 cars. Mains water, electric and drainage. 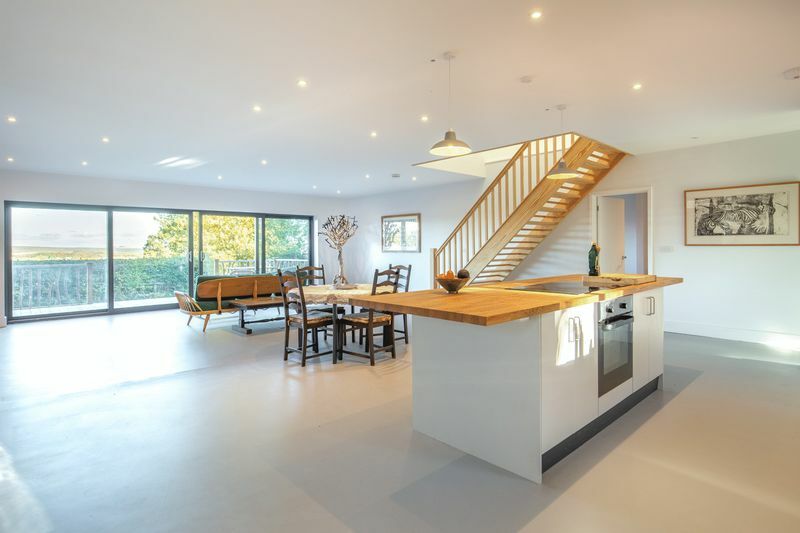 LED lighting used throughout, with 7 zones of under floor heating on the ground floor, electric underfloor heating in upstairs bathrooms and central heating radiators in the bedrooms and landing. All windows are double glazed and the house is well insulated with sound proofing in the floor of the entire first floor. 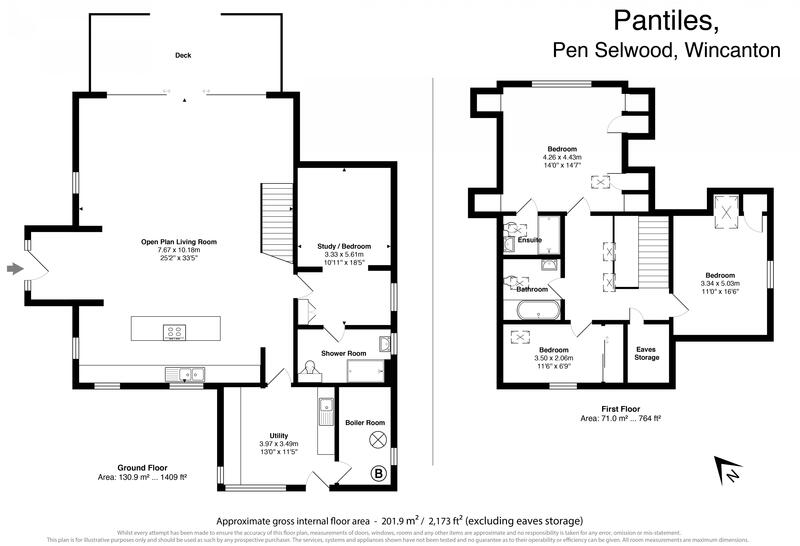 Pen Selwood is close to Wincanton, a small Somerset town that is rapidly gaining popularity. 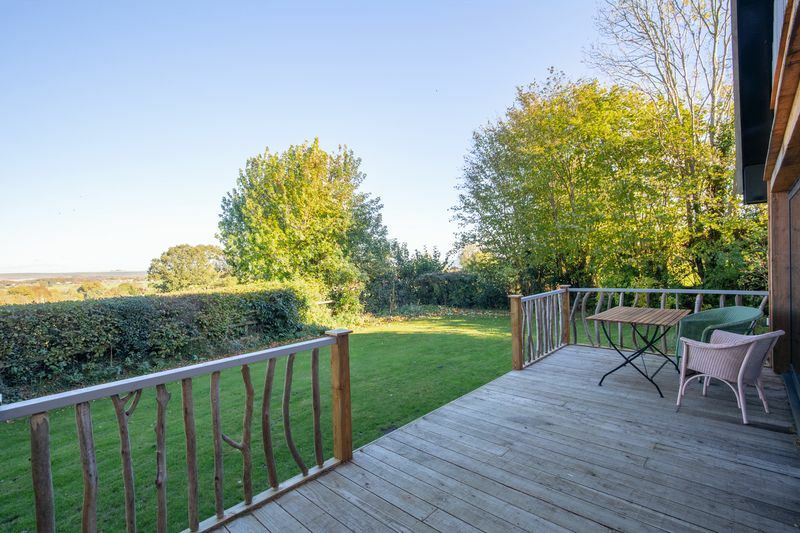 It is very well located for commuting, lying just north of the A303 which links to the M3, plus it is approximately six miles from the mainline railway station at Gillingham with services to London Waterloo and Exeter and a few miles further to the north is Castle Cary, which is on the Paddington line. Wincanton offers amenities including banks, doctor's surgeries, schools and two supermarkets and nearby Gillingham has a Waitrose. 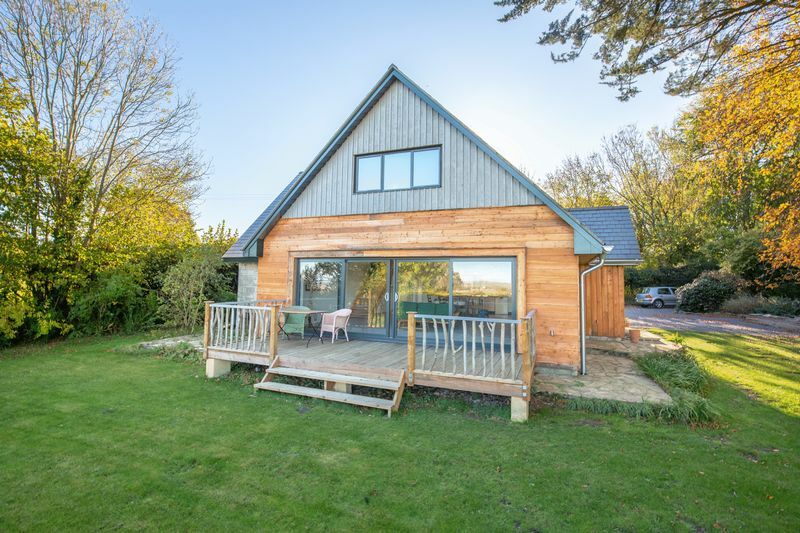 It offers better value for money on property but is only 15 minutes from the very popular town of Bruton, a fashionable and popular town in the heart of the Somerset countryside. Bruton has several well-known restaurants, pubs and bars including “At the Chapel” and “The Roth Bar” at the world-renowned Hauser & Wirth Gallery. The town also has a doctor’s surgery, pharmacy, vet, post office, several mini supermarkets, fuel station and numerous independent shops. Other notable local towns are the Abbey town of Sherborne, the Cathedral City of Salisbury and the ancient hilltop town of Shaftesbury. The larger town of Yeovil is approximately 15 miles distance which has a hospital and all the usual facilities expected of a bigger town. For further shopping and recreational activities, Bath and Bristol are within reasonable driving distance. There are excellent local independent schools in the area including Hazelgrove, King’s School Bruton, Bruton School for Girls, state boarding school - Sexey's, and the Sherborne Schools. Wincanton has two primary schools and King Arthurs Community School. n accordance with the Consumer Protection from Unfair Trading Regulations 2008 the information provided by Lodestone in these property details are to the best of their knowledge and are as accurate as possible.